Shortspur Seablush (Plectritis congesta) blooming below a large Oregon White Oak (Quercus garryana) on Southern Oregon Land Conservancy's Rogue River Preserve. Oak woodlands are truly special places. Among ecologists, they are famous for holding troves of species, many of which are unique to oak habitats. On a personal level, I find them utterly surreal. With relatively flat terrain, a parklike canopy, and abundant plants and animals (and in the case of southwest Oregon, magical vernal pools), oak woodlands are an idyllic and comforting place to wander (during the cool months at least). Unfortunately, the virtues of oak woodlands have also been their downfall. Vernal pool/oak woodland habitat being restored by ODOT and The Nature Conservancy near Central Point. Because they occur in the lower and flatter parts of southwest Oregon, oak woodlands are located where people also want to live. First farms and ranches, then orchards and vineyards, and finally cities, suburbs, and other developments have replaced the oaks since Europeans arrived. 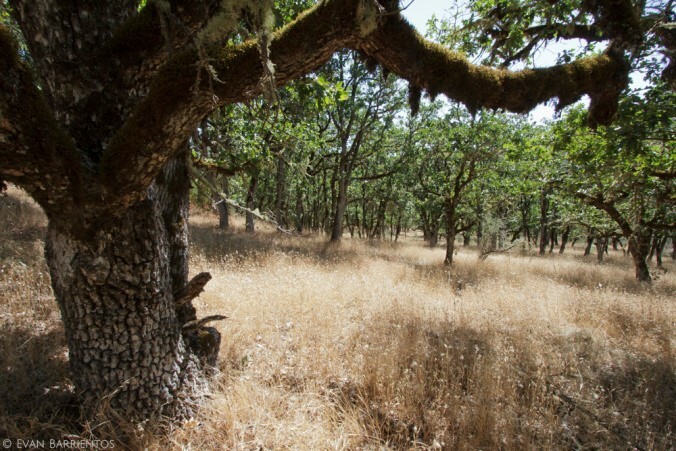 Shockingly, less than 10% of Oregon's historic oak woodlands still exist. What habitat remains is often degraded by fire suppression and invasive plants. 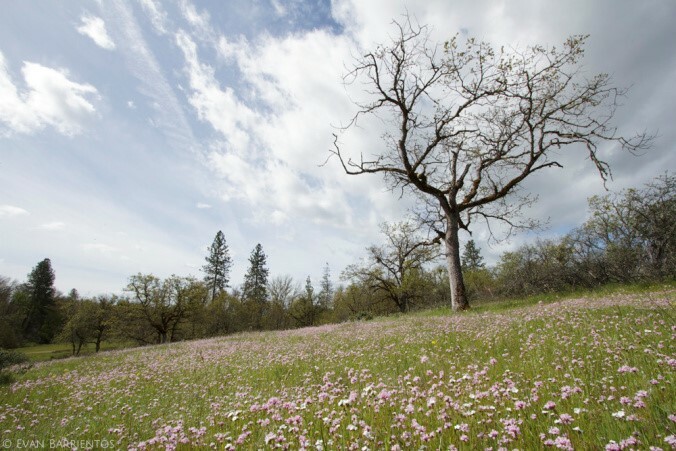 With this decline in oak habitat, species like Lewis's Woodpecker and Southern Oregon Buttercup (Ranunculus austro-oreganus) have suffered as well. Oak woodland plants like blue dicks (Dichelostemma capitatum) are threatened by invasive grasses like bulbous bluegrass (Poa bulbosa). But what I find most troubling is that we just don't seem to care that much. How often do you hear people talk about their favorite oak woodland or lament the decline of oak habitat? Unlike lush, evergreen-covered mountainsides, oak woodlands only take your breath away if you look closely during a specific time of year; but boy can they take your breath away. Hikers admiring SOLC's Rogue River Preserve on a public hike last spring. Conserving Oregon’s remaining oak habitat is a challenge because much of it is on private property. Fortunately, SOLC is the local expert on protecting private land with conservation easements and conserving oaks is one of their top priorities. Last month I joined their Land Steward, Karen Hussey, on a trip to monitor such an easement outside of Eagle Point. A key part of Karen's job is to be a trusted source of information for private landowners who put their land into conservation easements. There are many reasons people choose to do so but what unites them is a love for their land. Staff meet with all landowners every year, listen to their stories, and work with them to create a plan to achieve their goals while enhancing the conservation value of their land. It's a job that I often envy. Karen Hussey, SOLC Land Steward, rock hopping while easement monitoring. On this particular site visit we started by chatting with the landowner, Jim. While Ash-throated Flycatchers and Rufus Hummingbirds chattered around us, Jim recounted the challenges of controlling invasive plants, redirecting trespassers, and nursing sick trees. But underneath all the work, it was clear that Jim really loved this property for its solitude and beauty. I would too. Healthy oak habitat on Jim's property, protected by a conservation easement. After our conversation, Karen and I headed into the oak woodland above Jim's house to put up some snazzy new SOLC boundary signs. Although we came during the dry season, it was clear that wildflowers were abundant in the spring. There were also some impressively large, old oaks to admire, and we came across two clusters of deer/elk beds. I had to leave after a couple hours, but I could spend several days exploring the plants and views of that property. Karen installs boundary markers to inform visitors of the land's conservation status. Oak habitat requires dedicated stewards to actively manage it. 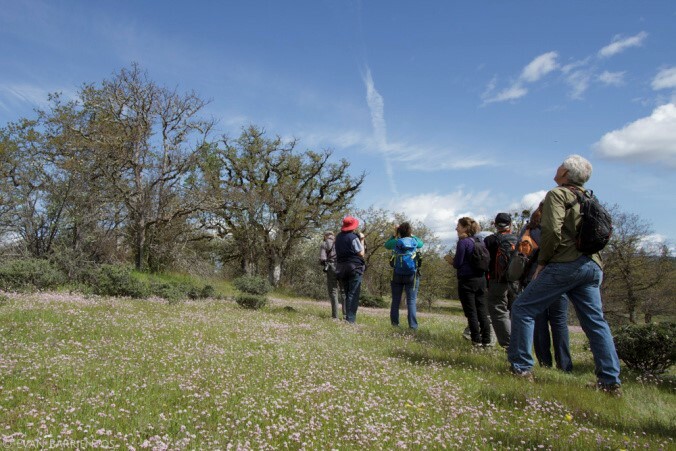 If you happen to own oak habitat that you'd like to protect, consider reaching out to SOLC and/or the Klamath-Rogue Oak Woodland Health and Habitat Conservation Project. If you don't own oak habitat, I highly recommend spending some quality time with it at Roxy Ann Peak, the conserved Jacksonville Woodlands, and Upper and Lower Table Rocks. The oaks need more people to fall in love with them! Evan is the monitoring and outreach assistant for The Nature Conservancy in SW Oregon. He hosts a blog, The Naturalist Lens at natlens.wordpress.com. Henderson's Shooting Stars (Dodecathon hendersonii) are one of the many plants abundant in healthy oak woodlands.